Since October’s historic flood, Gills Creek Watershed Association and several groups of volunteers have held over 10 clean-up efforts to remove small to medium-sized debris from the creek. During the Flood, Gills Creek Watershed Association (GCWA) Program Director Erich Miarka was driving around looking to see where he could help. According to its website, the watershed contains over 70 miles of streams and lakes, and 47,000 acres of land. It is the largest impaired urban watershed in the state, meaning its ability to carry out its natural functions has been reduced to the point where an imminent threat to health, life, or property has been created. As municipalities across the state continue the rebuilding process after October’s historic flood, people like Miarka say now is the time to rebuild urban watersheds in a more modern and smarter way. Click Here to Listen... Coverage of South Carolina flood recovery is made possible in part by a grant from the Corporation for Public Broadcasting. On the left, a picture of Forest Drive in 1917. On the right, a picture of a section of Forest Drive in 2016. The photo on the left was used in the May issue of The Big Splash, the newsletter of the GCWA. Provided by Fort Jackson, the pictures shows how Forest drive looked in 1917. With the heading “A History of Alternation,” the caption used states “the meandering Gills Creek that flowed slowly from Dent's Pond was changed to a straight, swift, deeper stream in order to drain the land for construction of Camp Jackson.” The photo on the right shows a snapshot of Forest Drive today. The low-lying, liner road is lined with significant development. The image above is a Google Maps Satellite view of the section of Forest drive close to where volunteers cleaned flood debris behind Trenholm Road. The aerial view allows us to see how much development currently sits in this section of the watershed. 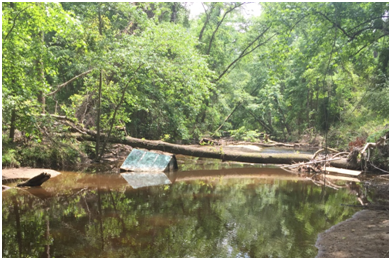 LISTEN: GCWA Program Director Erich Miarka talks about cleanup progress at a section of Gills Creek behind Devine Street. Several structures along Forest Drive were damaged during the flood. Many businesses like Forest Lakes Fabrics have since re-opened. Another hard hit area in the watershed was a stretch of Divine Street and Garners Ferry Road. Some commercial buildings remain in ruins. Miarka said rebuilding in these areas would be a mistake. “That means not building back the Subway, and the Title Loan Place, and Title Max place right next to the creek. That’s putting people in harm’s way. That’s putting property in harm’s way and that’s insuring that the next time it floods, we’re going to have a costly disaster,” he said. As GCWA Program Director, Miarka is dedicated to restoring the watershed through education, grass-roots action, public and private partnerships, remediation projects, and controlled development. “Ideally, there would be no structures in the floodplain.” Miarka said this does not mean people shouldn’t be able to use floodplains. “We’re working on a greenway project that will go along Gills Creek from Kilbourne Rd. down to Bluff Rd.” Miarka said this project started three years ago with a grant from the Richland County Conservation Commission. 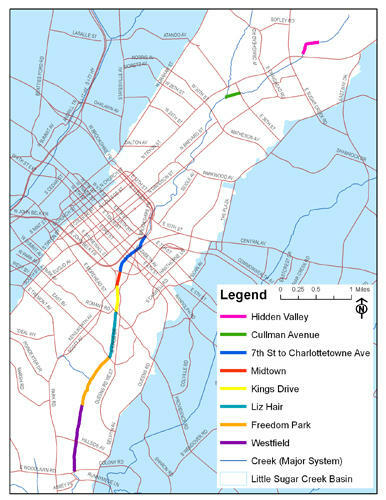 “A lot of other communities, use their river or stream corridors in the floodplains as paths of recreation that could be something like a greenway; like a walking and biking trail. Miarka said the Little Sugar Creek in Charlotte, NC had a lot of similar issues that Gills Creek is currently dealing with. Gwen Cook is a Mecklenburg ParkS and Recreation Planner. She said the Urban Little Sugar Creek Greenway in the Uptown Charlotte of area is a place for the community. The greenway is a little over a mile long and includes stone walls, water features, swings and access points to the creek. “There was a stream enhancement project that happened that was very important,” Cook said. Stabilizing the slopes of the creek to prevent erosion during major floods, she said, was very important. LISTEN: Gwen Cook, Mecklenburg Park and Recreation Planner talks about the economic benefits of the Urban Little Sugar Creek Greenway. Miarka said cleanup efforts tend to slow down in the summertime for a couple of reasons. “It gets really hot and we don’t want to stress out volunteers too much." Because the floodplain and the areas around the creeks really grow up with vegetation, Miarka said it gets difficult to access some of these areas. Because summers in the Midlands can bring big rainstorms, there is a big concern that the debris could cause localized flooding issues. “If you look down where we are now, there’s five, large industrial dumpsters and a lot of vegetation debris that’s kind of forming artificial dams." Miarka said this in-stream debris may not cause problems in lesser-developed areas, but when you get closer to roads, bridges, culverts and people’s houses, he said there is a concern that debris could “back-up” the water, during the next big rainstorm and cause some localized flooding issues nearby. LISTEN: How in-stream debris could cause localize flooding issues. From watersheds to flood plains, October’s historic rain event and flood has given us the opportunity to re-learn about many aspects of our local environment. Below, two experts from their respective fields talk about the importance of swamps and differentiating between flood plains and floodways. LISTEN: Dr. Susan Cutter, director of the University of South Carolina’s Hazards & Vulnerability Research Institute, explains the difference between floodplain and floodway. Listen: Erich Miarka talks about the many ecosystem services of swamps.